Last summer the Pruchnicki family of Farnham, N.Y., adopted Shrek and Fiona, two Pit Bulls that had been rescued as puppies from a dog-fighting operation. Early this morning, the two dogs, along with Ivan, the Pruchnickis’ other rescued Pit Bull, paid it forward by alerting the family to a house fire. “It was about 3:30 in the morning. I heard the dogs going crazy.” Dave Pruchnicki told WIVB. The house had smoke alarms, but the dogs started barking before they went off. Shrek was the most vocal. “He was halfway up the stairs, and he usually doesn’t come up the stairs at all. You know he was telling us to get out,” Dave said. His wife, Dusty, grabbed their 5-year-old son and they all ran out of the house. “As soon as we hit the side door, the front windows blew in and the whole house went up in flames,” Dave said. The fire started on the front porch when embers that had been discarded in a steel bin were rekindled, Chief Peter Chiavetta of the Farnham Volunteer Fire Department told the Buffalo News. Dave and Dusty said that if the dogs had not been there, they probably would not have survived the fire. 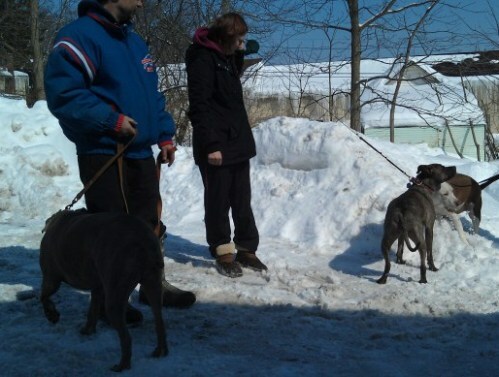 “Like I say, we rescued them and they rescued us, so I think we’re even now,” Dave told WIVB.